CEDS Sportswear is closing down its business after 21 years of operations! 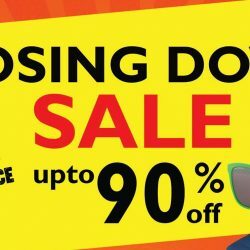  Head down to their clearance/closing down sale from now till 17 June 2018 to grab Oakley products at up to 90% off! Lazada got some great Special Promotions on Ray Bans and Oakley sunglasses, all at 40% off! Don't miss out! From now till 11 July 2016. 2 is better than 1! Purchase any 2 Oakley eyewear with 1 of it at a special price*. Promotion valid until 30th June 2016. Terms & Conditions apply.